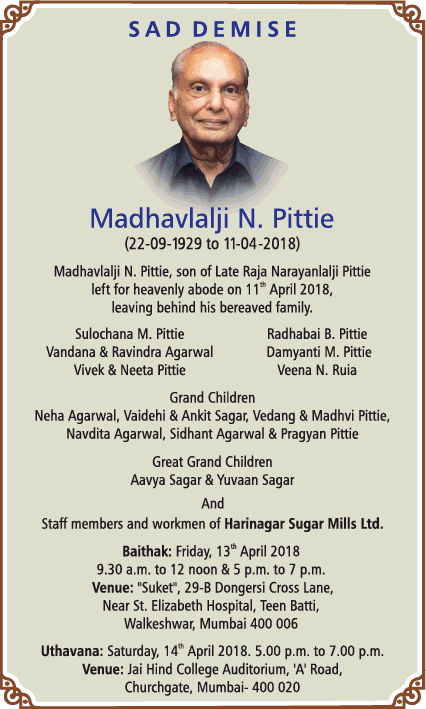 Madhavlalji N Pittie Obituary Ad. This Obituary Advertisement has been released in Times of India Newspaper on 13-04-2018. There are various Obituary Ad Samples available for Reference. There is a special page dedicated for Obituary Ad in Times of India. Obituary Ad in Times of India are placed under various heading like Sad Demise, Death Announcement, Prayer Meeting, Condolences, Remembrances, Death Anniversary, Birth Remembrances, Ceremony, Marka, Seventh Day Mass, Uthala, Tributes, Kriya, Hashkaba, Bhog Ceremony, Besna, Commomeration Haven, Daskhriya Vidhi, Homages. To advertise Obituary Ad in Times of India Mumbai check out Times of India Obituary Advertisement Rates and other information. And if you are looking to advertise in Classifieds Section then book Obituary Ad in Times of India online for Newspaper.